One of the duties that you have as a worship leader is to select songs for the church worship service. I will cover a few tips that will help guide you through the process of making a praise and worship list. I am a firm believer that the music and the message should support each other. With that in mind, I suggest that you first consult with your head pastor. As the leader of the church it is his job to guide the congregation. The pastor should reveal the message topic to you. This will give you the opportunity to discover what the upcoming sermon topic will be so you can plan accordingly. As you consult with the head pastor you will get a sense and feel for the direction the church is going. The pastor may even suggest some songs that he feels would be appropriate. Let’s say for example that the upcoming message topic his “Humility” and the key scripture is James 4:6-10. This will give you a starting point in your song selection. With this bit of information you can now move on to the next item. Once you know what the message is about it is a good idea to take some time a pray. As you pray let the Holy Spirit guide and direct you. Let God speak to you and reveal His will for you concerning the song selections. While you are praying you may get ideas as to what songs will be useful to the worship service. When you have direction from God you can now proceed to the next item in creating a praise and worship list. Once you have your list of potential songs you will need to organize them for the church worship service. This will create a flow of songs. The following chart gives you an example of how to create song flow during a worship service. Use this chart to help you plan the songs you will use in your church’s service. Please note that this is a simple outline to follow. It will help you get started. But ultimately, it is the Holy Spirit that will guide you though this process. Attention: you will start the service by presenting a song that will get the “attention” of the congregation. This is a call to worship. Focus: Once you have the attention of the congregation then you offer a song that will help the people start to “focus” on God. Celebration – In addition to Praise and Worship you have the option of flowing into a song of “celebration” The main portion of the service will fall into these three types of songs – praise, worship and celebration. Move freely between each of these three types of songs. Offering – This is the time where the church performs it act of giving. Once the offering song is complete you continue by presenting “special music”. Special Music – This could be a guest artist or it could be a song that reinforces the message of the entire service. Song that leads into message – By this time the church should be prepared to receive God’s word. As with all the songs used in the service this one needs to lead into the message topic. As you move through Your Service, your goal is to prepare the people you serve to enter into a place where they not only experience the presence of God, but also prepare their minds to receive the Bible study message. 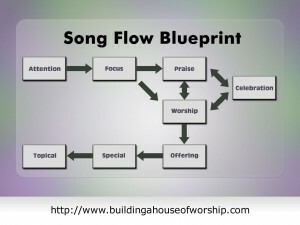 Taking the outline of the Song Flow Blueprint you can now create a praise and worship list. Place each song in order. Get all your recourses together. Now you want to communicate with your singers and musician the songs they need to learn and know. You will need to schedule a rehearsal to go over the song selections. Make sure that each member knows their part.